Fashion and tech are friends now. The Tag Heuer Connected, Apple Watch Hermès Edition. It's official, sure, but these collaborations often arrive with eye watering price tags. Enter Fossil and its - relatively - affordable range of smartwatches and smart bracelets, all based on existing fashion accessories. 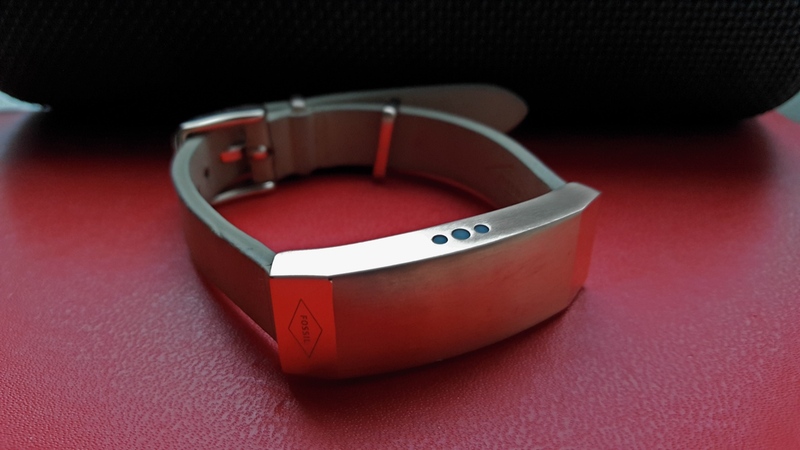 The Q Dreamer is a very similar device to Fossil's Q Reveler and you can read the review of this, more masculine fitness tracking bracelet, for an in-depth look at the features, app and tracking shared by both options. So we'll keep this review short and sweet and focus on what the Q Dreamer brings to the notion of a fitness tracking piece of smart jewellery. Starting with the fact that depending on which model you choose, this is Fossil's Wearable For Girls. You're paying for the Q Dreamer's pretty looks here and very pretty it is - not in your face like say, Opening Ceremony's MICA bracelet but chic enough to get me plenty of genuine compliments during the time I've been wearing it. The tracker comes in two styles - the feminine rose gold finish/pale pink leather and more masculine stainless steel/black leather. There are also a couple of interchangeable 12mm straps (turquoise, brown, white etc) which you can buy later on to switch out. It's better looking than pretty much any other bracelet style tracker I've used so if that's important, this could really sway you. It's super light, at 28.2g, and IP67 water resistant down to 1m too - that's not really designed for swimmers, and you won't want to get the band wet, but it does put your mind at ease in terms of cooking mishaps and rainy days. Three LEDs adorn either side of the hidden tech module which you can set up for alerts - we'd have been happy with just one set as over dinner, it can be distracting for the person sat opposite when you receive a text. Not as subtle as it could be. It's well built, feels secure and the 10mm module doesn't feel as chunky as a smartwatch with an LCD screen would. Now, I'm not the best at keeping my gadgets - or my accessories - in perfect shape but the Sand leather and rose gold Q Dreamer I've been wearing has fared worse than most (as you can tell from the pics). The pale pink leather band got grubby very quickly and the main module scuffed really easily. Bear this in mind if you're looking for a 24/7 wearable. It's also worth noting that Fossil's ID Plaque bracelet (which the Q Dreamer is loosely based on) is about a third of the price so this is quite a bit more expensive. Expect prices to drop next year when Fossil cottons on. Before we move on to what the Q Dreamer can do - a quick warning, as Wareable's editor Michael Sawh experienced with the Q Reveler, we have also had Bluetooth issues on Android. This was in the form of (annoying) sporadic error alerts saying that the Q Dreamer wasn't connected, the actual pairing process went smoothly. Fossil's range seems to get on better with iPhone - and we've certainly experienced worse - but on Android, it might not be really enough to entrust it with your alerts. Still, when it works, here's what Fossil's smart bracelet is capable of. First up, alerts - the Q Dreamer handles these nicely with standard smartwatch-style vibrations and the aforementioned LEDs letting you know when you've got a message. There's no screen so you need to head back to your smartphone to actually find out what's going on but you can assign LED colours to different apps. Next, tracking. This is as simple as it gets - more so even than Misfit - and there are no complicated sensors or extras like GPS. The Q Dreamer's three axis accelerometer tracked our daily steps and distance within about a 10% margin error of the accurate (and cheaper) Misfit Shine 2. Basic features like an alert and animation in the app when you reach your daily goal are nice touches but, in my view, don't go far enough to help you make real lifestyle changes. There's no sleep tracking and no heart rate data - the only extra you get is an estimate of calories burned. If you want a stylish smart bracelet which comes with the added bonus of nudging you to move more and alerting you to messages and emails when you're on the move, this is a great fit. If you have a particular fitness goal or you want to track sports, look elsewhere to more practical, slightly uglier wearables. I liked the app's UI and this is a great step in building a user friendly, lifestyle app when something like Fitbit might be too much. But I really missed the extra detail and motivation you get from dedicated fitness tracking apps, whether that's daily, weekly or monthly graphs, smart coaching hints or more of a community to inspire each other. Daily goals and progress are easy to glance at so it works in this sense but there's more work to be done here. One great aspect is that Fossil has kept this range nice and open so you could save the Q Dreamer for going out or weekends away then sync it to Google Fit, Apple Health, Under Armour or Jawbone's UP platform. The less said about the Q Curiosity challenges the better - if you're into life affirming Instagram photos and playing Manic Pixie Dream Girl you will love them. If not, they are easily ignored. What's more helpful is being able to choose which apps you'll get notifications from in the app and also assign different coloured LEDs for types of alerts. It also tells you how many alerts you've had which is a bit overwhelming/unnecessary. The Q Dreamer tends to last between six and nine days in use and, of course, it depends on whether you just want a passive tracker or LED-blinking, vibrating alerts constantly seeking your attention. That's pretty decent, better than most alert-only smart jewellery and comparable to more practical trackers like the Fitbit Charge HR. Still, the Misfit Shine 2 handles fitness tracking - and sleep tracking - as well as alerts and lasts up to six months on a coin cell battery. The Q Dreamer isn't so impressive when you consider that comparison. As for the charging, it comes with a bundled wireless charging cradle which to be honest I find rather fiddly but it's better than plenty of other solutions. If you wouldn't be caught dead wearing a black plastic band, this is the tracker for you. It's not the most useful, motivating or best value for money device but for many, it could be a choice between wearing this stylish smart bracelet or forgetting your whole health and fitness plan. Android issues aside, it handles both basic tracking and alerts nicely but in almost every instance, there's a trade-off to consider before you buy.